The 9 Best Brunch Spots in Mississippi! Weekends are the perfect time to get together for a laid-back yet elegant tradition: brunch. 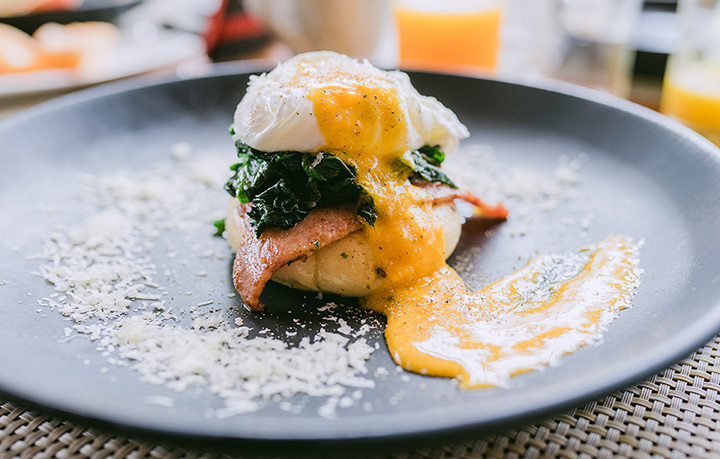 All throughout Mississippi, our finest restaurants are hosting weekend brunches featuring everything from traditional Eggs Benedict to fresh salads and sandwiches. Here are the best brunch places in the state. Anjou is a premier destination in the Jackson area for fine dining and special occasions, but they also offer a phenomenal brunch. Relax with friends and enjoy the French-inspired cuisine, which includes escargots, crepes, Salmon Nicoise, Croque Monsieur and much more. Cora's Restaurant and Bar is located in Biloxi's historic White House Hotel, which dates back to the 1890s. Cora's brunch is held on Saturdays and Sundays. Be sure to take advantage of the specialty mimosas and Bloody Marys before sampling their classic Southern-style menu. In the city of Meridian, one name in restaurants has stood out for nearly 150 years. Weidmann's is upscale yet laid-back, and it's the perfect spot for a relaxed brunch. You'll want to try the fried green tomatoes with 1870 Sauce as an appetizer before browsing the extensive entree selections. Hattiesburg is one of the most innovative food cities in our state, so the competition for best brunch spot is fierce. The honor goes to Cotton Blues, which uses a majority of fresh and locally sourced ingredients. Enjoy complimentary bottomless mimosas as you dine, and don't miss the cornbread honey French toast! Saltine Oyster Bar in Jackson offers elevated comfort food with a cutting-edge twist, and their brunch menu is no exception. The brunch oysters are topped with quail eggs, the chicken biscuits are made with pickle-marinated chicken, and their nitro cold-brew coffee is worth the trip alone! The Sycamore House in Bay St. Louis originally started as two homes which were combined into one in 1850. Their brunch menu is fine dining with an Indo-Asian twist, and the seafood-rich selections include everything from scallops and shrimp to a classic Southern turtle soup. Bacchus on the Beach blends New Orleans-style seafood with the breezy atmosphere of the Gulf Coast. Located on Scenic Drive in Pass Christian, overlooking the Gulf of Mexico, the view here is the perfect setting for a relaxing brunch. Start your meal with a dozen oysters of your choice, and don't miss the shrimp and grits. City Grocery is a place that's elegant yet welcoming, with white cloth tablecloths that are balanced out by the exposed brick on the walls. City Grocery is constantly evolving its menus to push the status quo, but it's never pretentious. Whatever you order for your Sunday brunch, be sure to start it with an order of Monkey Bread. Stanton Hall was originally a Greek Revival home in the heart of Natchez. Today, it's a popular historic stop as well as home to Carriage House, which is famous for its fried chicken. You'll find the fried chicken on their Sunday Brunch buffet, but you'll also find a selection of items including Thai curry shrimp bisque and poached salmon.